My four-year-old loves bubble baths. She hasn’t had very many in her life, because every time I think of buying her bubble bath, I scope out the ingredients of bubble baths that are sold in the store, and I promptly put it back on the shelf. She has sensitive skin, and it doesn’t take much for her to break out in eczema or a number of different rashes. Additionally, I know how absorbent the skin is, and I don’t think her small body needs to absorb chemicals, synthetic dyes and fragrances. So… when Christmas time rolled around, I saw bins of cheap beauty products for sale and covered with cartoon characters. I went against my better judgement and bought Elle a bottle of commercial bubble bath in a Doc McStuffin bottle. I just stuck it in my cart without reading the ingredients… and when I got home, I was horrified. 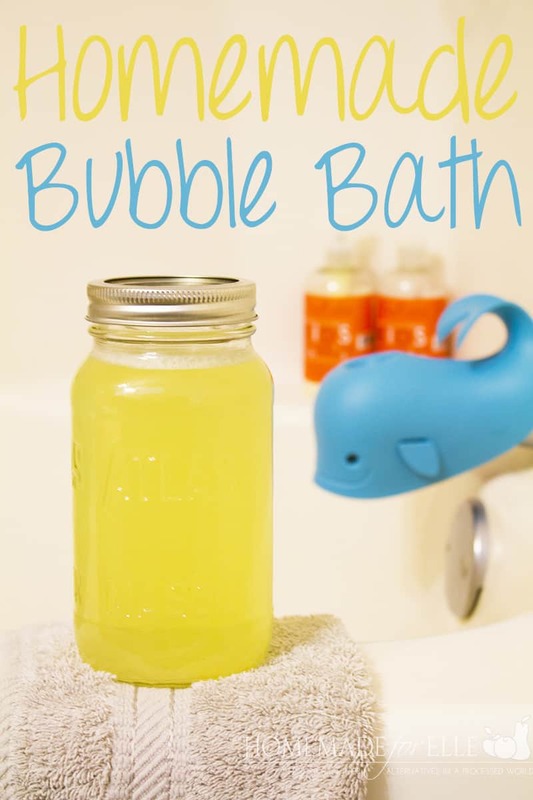 At that point, Elle had already seen it and was begging to take a bubble bath, so I decided enough was enough, and I was going to learn to make my own homemade bubble bath. As it turns out, it’s so incredibly easy, I’m surprised I hadn’t done it yet! Gently combine all ingredients in a clean mason jar. When ready to use, add 1/2 cup (no need to measure, just estimate) of your homemade bubble bath to warm running water, and enjoy the bubbles! The great thing about this recipe is that you can adjust it to suit your needs. 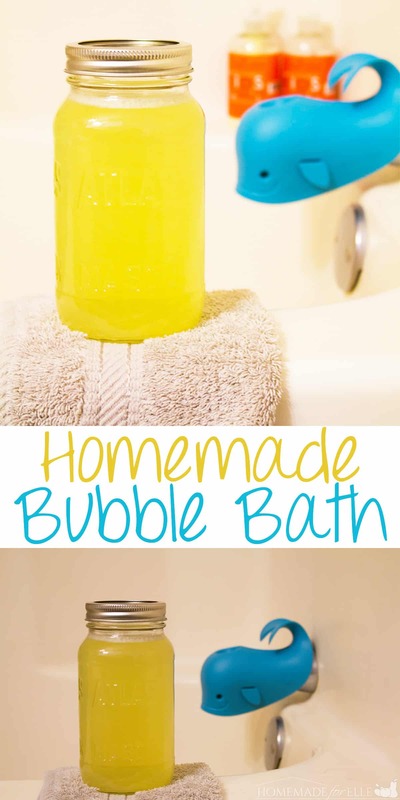 If you happen to want to make a more adult version of homemade bubble bath, you can half the liquid castile soap (less bubbles) and add in a tablespoon of coconut oil and some essential oils to make it a more indulgent, but less bubbly blend. Play around with it until you find a recipe you love! Tell me where I can find glycerine? Hobby Lobby, Michael’s, Vitamin Shoppe, Target, Walmart…. No one carries it. Hi Brenda – I thought they wold it at Walmart, but I know for sure Amazon carries it (http://amzn.to/2zl2Fut). Hobby Lobby carries a vegetable glycerin along side there soap making scents and colors.